With the New York Rangers coming off a two-game losing slump, NYR Goalkeeper Henrik Lundqvist pulled out a win against the Ottawa Senators in the shootout, the game winning goal by 'called up Hartford Wolfpack P.A. Parenteau.' The Blueshirts are now 2-0 against the scrappy Senators and now look a healthy 11-8-1 this season. Though not perfect, this afternoon treat provided a crack of optimism after the two day slump I've suffered having witnessed the Rangers loss to Atanta on Thursday night. But allow me to throw a little DARK into the 'win'. With Brandon Dubinsky and Chris Drury out on injured reserve, coach John Tortorella chose to move hardly-scoring Chris Higgins (2 goals, 3 assists) up front to play center with Paranteau (AHL 10 goals, 10 assists) playing to his left on the second line. I heard today that just under 20% of the NHL is either out on injured reserve or day-to-day. The league should require the IR-flu vaccine to all eligible players. It was a blue-collar game full of cheap hits, half-hearted forechecking, scrappy playmaking, evenly matched and questionable defense on both ends. After some redeeming games, former Senator and now pricey-Ranger-defending Wade Redden was up to his old tricks again. You 'old dog you! Thirteen minutes into the first period, the most exciting moment (if you live in Ottawa) was seeing Wade expose the neutral zone allowing an easy Kovalov feed to Jonathan Cheechoo breakaway straight at Henrik Lundqvist. Blocked! Thanks to Henrik's demi-God instincts, a goal was denied. After 240 career games as a Senator, I wonder how Wade Redden felt being invisible on the ice? That's rhetorical. Although I think the neutered Sean Avery is trying to find his new role as part of this bionic Blueshirts squad, he did agitate and play a strong puck-moving game. More essential, our boys-in-blue defended Avery, multiple Otta-weenie melees against Sean followed by 'Blueshirt Retaliation'. This is refreshing, especially in light of how Avery has allegedly not been getting along with his locker-room. The second period Senators broke through on the scoreboard, Jarkko Ruutu feeding Brian Lee in the slot giving Ottawa the lead and deflating anyone watching the game. Our fourth line response went sour as Boyle passed to Brashear pass to Voros...nothing. Crap. On a side, just watching Jason Spezza and Daniel Alfredsson today makes you appreciate good hockey and how chemistry works. Though not connecting with the net, they created so many opportunities but were simply denied by our goalkeeper -- simply stunning to watch (thanks again Henrik!). Despite four second period penalites (too-many for any game), we tied it up with a beautiful Marian Gaborik feed to Vinny Prospal for a shortie! Ironically, it was Prospal's first short-handed goal. Who knew? The game was 1-1. The third period was gritty and fun to watch. It was anyone's game to win. Both teams never resembled anything compared with the first and second period -- another nail biter. This level of nervous energy led to overtime, which led to the dreaded shootout skills competition. With more than five failed shootout attempts by both Rangers and Senators, 'commuter' Parenteau was asked by coach John Tortorella whether or not he was any good at the shootout. What else is the guy going to say? So with that, P.A. flipped a nice goal in the top right corner and took the deciding goal. P-A-R-E-N-T-E-A-U!!!! A good performance by a call-up, despite the game winning goal, no one watching will forgive him for missing the wide open feed with 3 minutes left in the third period, but overall, a solid performance. So Rangers fans, sleep well knowing that we have three days off before our playoff nemesis steps into the Garden on Tuesday night. The Big 'O' hopefully will wake up Tuesday morning not feeling up to the challenge which will be fine with all of us. Sleep well knowing that the team looks the same with Drury and Dubinsky out on injured reserve, so remember that we are a highly coached team with a system that should work - plus an elite goalkeeper who always keeps us in the rankings. Let's go Rangers fans! Enjoy the weekend. You are quite the name caller Mr. Anonymous. Thanks for visiting. No hate here, just DARK. I just expect our six million a year D-men to play more than just a 'decent game', as you say. Come on Wade Redden wet his pants three or four times yesterday. He plays like a fourth liner. Hate away Dark! Actually, I thought our rookie Gilroy made too many crucial errors rather than Redden. Strong D game by Staal and Girardi. We should all be picking on Rozsival!!!!!!! Redden was a great D-man when he played with/behind Chara. Redden was capable of moving the puck with a strong first pass out of his end and could run the PP. At this stage in his career he has lost a step and more importantly his confidence. The 6 million dollar contract is just that - a contract. Don't expect him to be anything more than he is! He is a solid second number 3/4 D-man. 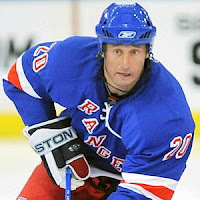 Redden isn't part of the future for the Rangers and was a good signing at the time gone bad. Sather didn't expect the kids to develop so quickly and step into the lineup and contribute in such a big way. Stall/Girardi/DelZotto/Gilroy are the present. Bobby Sanguinetti helps bring talent to the future BlueShirts and will play a key role next year playing 12 minutes per game. Bobby could also be great trade bait at the deadline this year for some forward depth. Trade Roz at the deadline for a second and take some salary back in the deal. My God, a defender of Wade Redden. Next I bet you think Chris Drury is a decent Captain. What is next? Redden not only was a bad contract from the get go blue nation leafs but an overblown Sather mistake. NY doesn't turn souring players into good players and the only platform we have with further souring players is to keep perspective - by ranking them over the coals. Redden is terrible and in Saturdays game he was below average for any blueliner. Come on gimme a break here. Hey "man are you dumb" guy. Did you just watch that Caps Bradley goal?